Over 100 women spoke out about Larry Nassar’s sexual abuse this week. Cable news barely covered it. 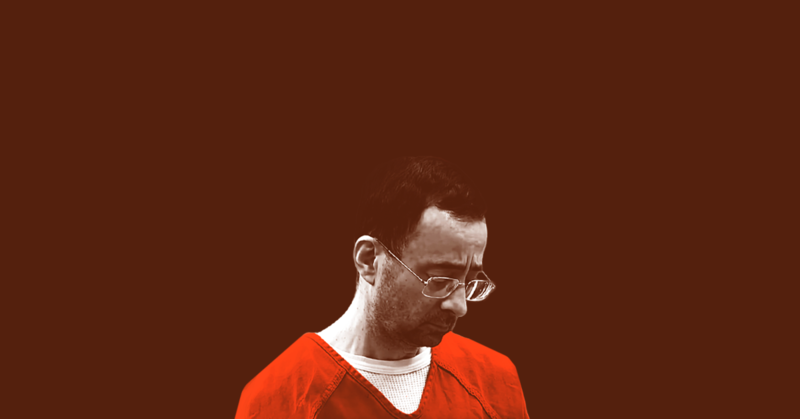 Home > Over 100 women spoke out about Larry Nassar’s sexual abuse this week. Cable news barely covered it. This week, dozens of women have shared their stories of being sexually abused by Larry Nassar, the former USA Gymnastics team doctor. Cable news channels barely covered it. In addition to the women sharing their stories in the courtroom, Olympic gold medalist Simone Biles  wrote a public statement about her experience with Nassar, saying, “I am not afraid to tell my story anymore.” Biles concluded, “We need to know why this was able to take place for so long and to so many of us. We need to make sure something like this never happens again.” On Tuesday, it was revealed that Olympic gymnast McKayla Maroney  could have faced a $100,000 fine for speaking about her experience with Nassar due to a nondisclosure agreement (NDA). Following an outcry of support, including model Chrissy Teigen offering  to pay the fine for her, the NDA was waived  and Maroney was able to give her statement , which was read in court. Despite this story being one of the largest-scale sexual abuse stories in recent history -- and despite its coming at a time when the #metoo movement is flourishing in some other industries -- it’s getting scant media attention from cable news. According to a Media Matters analysis, the three major cable news channels -- CNN, Fox News, and MSNBC -- have devoted just 19 minutes and 47 seconds of coverage to the events surrounding Nassar’s sentencing and the women’s statements. CNN spent 11 minutes and 49 seconds on the topic. MSNBC spent 4 minutes and 9 seconds covering the topic, and Fox News spent just 3 minutes and 49 seconds. CNN’s nearly 12 minutes of coverage far surpassed both MSNBC and Fox News; however, before Friday, CNN had only spent 3 minutes and 58 seconds on the topic. The network’s coverage picked up on the last day of Nassar’s sentencing with CNN’s morning show New Day hosting Jamie Dantzscher, a survivor of Nassar’s abuse. Women are finally getting the opportunity to tell their stories publicly. In this case, these women shared  how Nassar’s abuse changed their lives. Some of the women spoke of the self-doubt and depression they faced, and family members recounted how their loved ones took their own lives after Nassar’s abuse. It’s imperative that cable news starts doing a better job of lifting up their voices.